Simple supply and demand are dictating the slow implementation of green infrastructure in Canada. While municipalities promote its public persona and fix its impotent economic model, is the do-the-right-thing attitude of altruist land owners enough to scale adoption? There is a lot of pressure on green infrastructure. Part climate change savior, part urban revivalist and part path to civic prosperity, in some circles, green infrastructure is expected to lead the Great Urban Unbuilding of Canada’s next century. But despite testing technology throughout North America since the 1990s, the application of green infrastructure as a stormwater system here has failed to take root in any meaningful way. 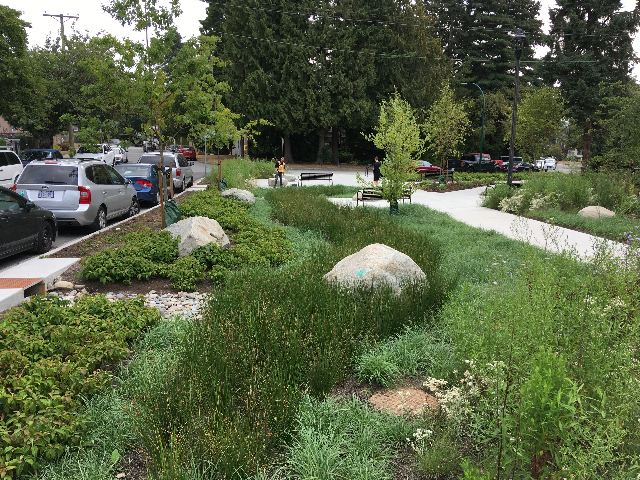 The critical mass for green infrastructure lies in retrofitting existing, dense urban land where stormwater controls do not exist in a surprisingly large proportion of Canada’s urban centres. Adding control in this way would be a panacea for cities, but one that, for now, remains out of reach until a viable economic model can be implemented, one which simultaneously fuels public demand and incents private supply. In the absence of a model, the momentum of green infrastructure relies almost entirely on early adopters and the altruist land owner. Vancouver is Canada’s Rain City, culturally and meteorologically. Inundated by over 1.1 metres of rainfall in an average year, it is the by far wettest of the nation’s big cities. Rain City as a nickname will be immortalized in policy when staff presents to council in early 2019 the Rain City Strategy, a “reimagining” of how water is managed in the region. Utilizing soils, plants, trees and built structures — a toolbox filled with green roofs, bioswales, rain gardens and more — the city’s goal is to capture and clean 90 per cent of the city’s rainfall before “returning it to our waterways and atmosphere.” Melina Scholefield, the city’s manager of green infrastructure implementation calls it a ‘holistic approach.’ “It’s about transforming how we do business, and trying to be integrative to achieve multiple benefits with a single investment,” she says. 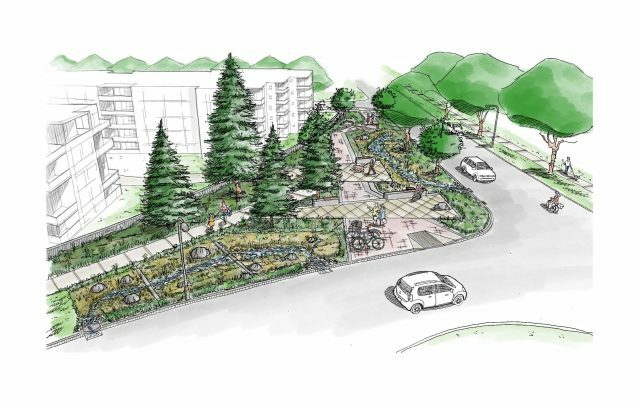 The corner of 63rd Avenue and Yukon Street in Vancouver was identified as an opportunity for green space in the Marpole Community Plan. Vancouver is to Canada what Canada is to the world. Nationally, our perception of water as infinitely abundant or, worse, an urban waste product, has set back green infrastructure implementation here by at least a decade. The slow process of changing that perception has required a combination of aggressive education and, sadly, natural disaster. Alberta and the Greater Toronto Area (GTA) floods in 2013, for example, killed five people and cost a combined $2.68 billion. In Vancouver, a severe summer drought in 2015 shook the foundation of the Rain City ideal but ultimately helped advanced the new water management strategy. Green infrastructure was, until recently, a solution to a problem most Canadians didn’t know they had. Image courtesy of City of Vancouver/Wendy de Hoog. The Credit River watershed, which drains into Lake Ontario between Hamilton and Toronto, has a split personality. 87 per cent of the watershed’s population lives below Mayfield Road in Brampton and Mississauga; all of the watershed’s significant surface water impairments can be found there as well. According to the Watershed Report Card 2018, surface water quality grades in Brampton and Mississauga ranged between C (Fair) and F (Very Poor). To the north of Mayfield Road, they were much better: B (Good) or C. Roughly one third of the watershed received a failing grade thanks in part to sprawl and bad timing. Last year, CVC commissioned an economist to answer this question and in February the answers came. Titled Economic Instruments to Facilitate Stormwater Management on Private Property, it recommends a “paradigm shift” in how municipalities approach stormwater management. Specifically, to improve the uptake of green infrastructure, it proposes a blend of sticks (e.g., land appropriation for easements; new ordinances and design standards), carrots (e.g., municipal credits; offsets; grants; subsidies and loans) and simply reducing the current costs of green infrastructure. Increasing stormwater fees so they, as Martin-Downs says, impact budgets for businesses is one way to push the green agenda, but potentially at fatal political consequences. 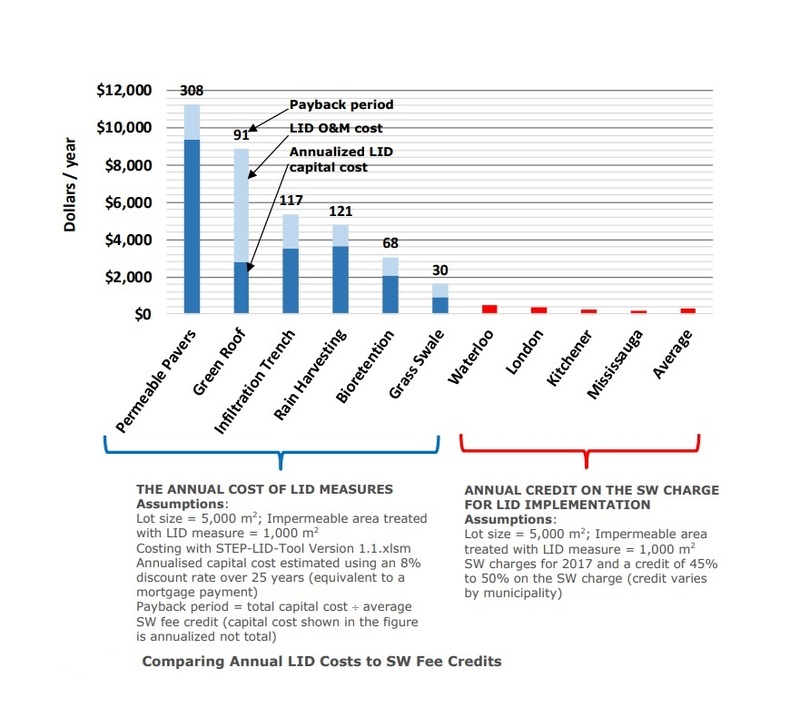 Instead, CVC believes significant cost savings can be found through property aggregation. Since the release of the report, they have begun testing the economics of aggregation by applying a green infrastructure strategy to a 38-ha network of 13 highly impervious commercial and industrial properties in Mississauga’s Southdown area. Much of the cost of implementing green infrastructure comes with design, certification, permitting and tendering. By aggregating properties into one neighbourhood-scale management concept, the hope is the economic case, and landowners’ buy-in, becomes viable. 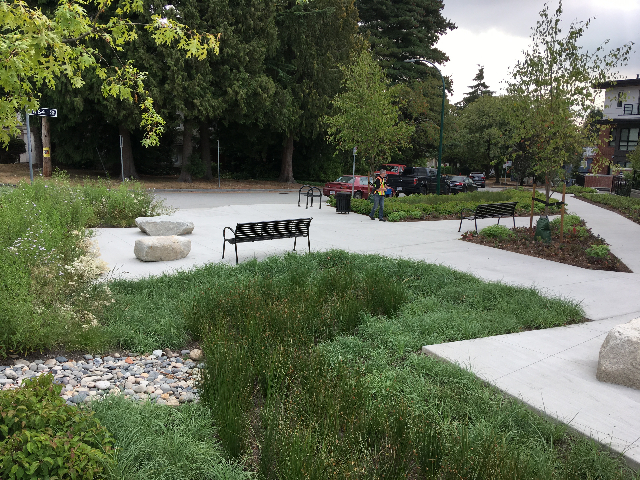 Credits for implementing green infrastructure can then be applied to reduce the stormwater fees paid to the city: a combined $120,000 per year for this network of properties. CVC also believes stormwater fee credits need to be combined with other incentives by “stacking benefits” through water and energy conservation channels. For now, CVC are excited about aggregation. To make it work, the process only requires a champion with a long-term vested interest in the viability of the green infrastructure assets and network, the CVC says. This could be a drainage superintendent from the host municipality, a conservation authority program manager or a property owner. But this model also opens the door for neighbourhood-scale non-profit organizations, signalling the potential future importance of homeowner and business improvement associations in urban water management. On September 6, in Canada’s second largest green building development just east of downtown Montréal, there was a celebration of sorts. The much-vaunted eco-district Technopôle Angus was turning 20 years old and developer Société de Développement Angus (SDA) was hosting une petite fête. The visionary two million square foot redevelopment project rose from the dust of industrial collapse. In 1992, Canadian Pacific Railway shuttered its Angus Shops (a railcar manufacturing and repair facility) vaporising 12,000 jobs and much of the vibrancy in the surrounding Rosemont-La Petite Patrie borough. Named Canada’s “Best Overall Project” in 2006 by the Canadian Urban Institute, Technopôle Angus has had transformational impact, now housing 2,800 workers from a tech-focused cohort of 65 companies in 13 LEED-certified buildings. 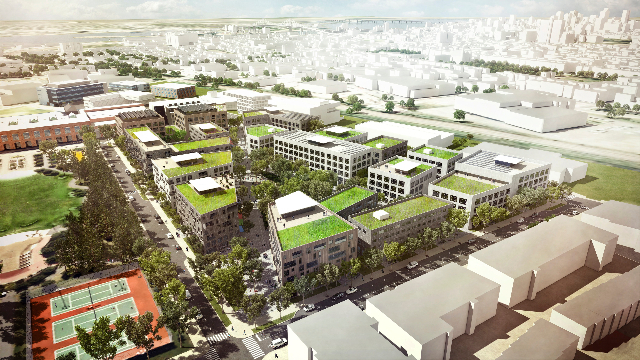 The development plan for Technopôle Angus has just obtained LEED v4 Platinum certification for sustainable neighbourhood design, and is one of the first green neighbourhoods in the world to be an employment hub. Phase II pairs the existing commercial space with 119 new residential units in the six-floor Cité Angus condominium to complete the vision of a socially focused neighbourhood with green finish. “The main objective,” says Charles Larouche, SDA’s executive vice president, “is to attract and keep middle class families in the city.” 80 per cent of the Cité Angus units have three or four bedrooms, most are more than 1,000 square feet and 85 are designated as affordable housing. As of September, 90 per cent of the units were reserved and decontamination of the site was set to begin in October. “We intend to start construction in the spring and deliver a year later in 2020,” Larouche adds. 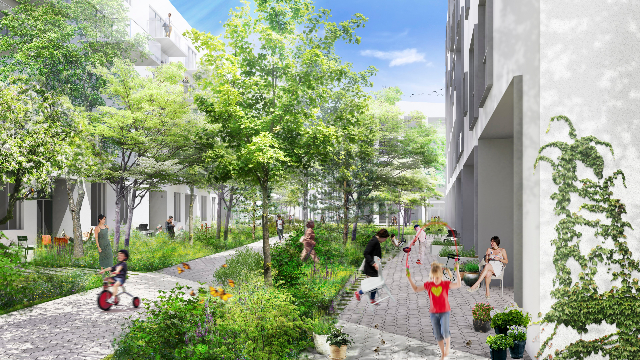 Located in the heart of a central residential district of Montréal, this new mixed-use green neighbourhood will transform a former industrial park into an urban village where businesses and families coexist in a vibrant and environmentally responsible community. What allows SDA to realize a project like Technopôle Angus is their not-for-profit status. “We do not seek the same returns on investments a normal real estate developer would seek,” says Larouche. 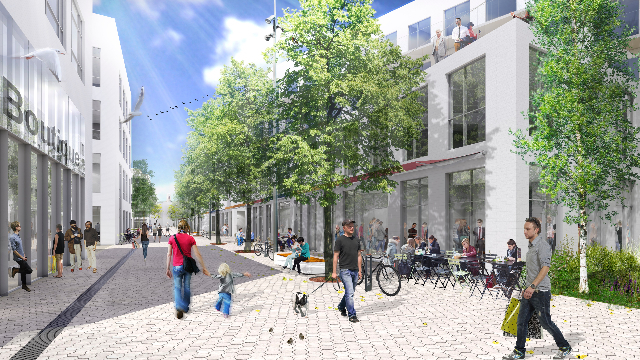 A self-described ‘social economy enterprise,’ SDA’s core business is “urban renewal projects that deliver significant spinoffs for the local community and embrace sustainable development.” Formed in 1995 only to lead Technopôle Angus, SDA has since expanded their project portfolio, leaving behind a trail of community-minded landmarks throughout the city: Carrefour de l’economie sociale, a 33,000-sq. ft. social enterprise hub opened in 2005; a 59,000-sq.-ft. home for culture and art organizations opened in 2012 called 2-22; and Carré Saint-Laurent, a 260,000-sq.-ft. development, including a 40-stall food hall; Centre d’Histoire de Montréal and office space for 900 provincial employees, is set to open in 2019 as a revitalization anchor at the corner of Saint-Laurent Boulevard and Sainte-Catherine Street. The slow growth of green infrastructure in Canada is best understood when measured against North America’s green building movement, whose genesis in the 1990s is a useful yardstick. Green buildings gained early momentum in large part due to the efforts of non-profit organizations like the National Resources Defence Council and newly minted US Green Building Council, who set out to galvanize industry players with a “respect for resources” and to “demonstrate responsible construction practices” through the LEED steering committee. Although a sophisticated schedule of incentives — a combination of tax credits, fee rebates, subsidies, permit accelerations and others — has been developed over time for those looking to build LEED-certified, accreditation is aspirational and entirely voluntary. The green building movement did not wait for regulation to create change in the industry, the industry created change from within while regulations followed. It’s hard,but we need to insist.